Posted On November 19, 2014 by Team iCynosure. 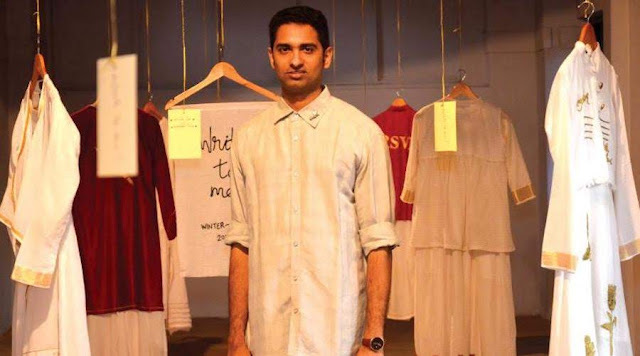 Since my last post about Sreejith Jeevan’s brand Rouka and styling his amazing pieces for my post, Strung Together, featuring 'Rouka' by Sreejith Jeevan, I had a wonderful opportunity to speak to him about his inspiration, collection and a few things related to fashion. iCynosure: Which of your two collections was tougher to create and why? Sreejith: None of the collections was tough. The part where the concept moves to the tangible product is always challenging but I have fun working on my collections, so it doesn’t matter. iCynosure: Do you have a specific research process when you start working on a new collection? Sreejith: Not really. My research comes from what I see everywhere. The clothes I make are what I feel people would love to wear and the concepts I work with are stories that have touched my own life. So I’m just telling a story I know. And since it’s a story that I know very well, I have fun expressing it my way. iCynosure: Who is the woman who is the perfect choice to convey your brand message? Sreejith: Everyone actually as Rouka is for the eclectic woman. Her canvas is huge; clothes are her friends; and her dreams are big. iCynosure: Did you visualize yourself showing at Fashion Week? iCynosure: On winning the best Fashion Film at LFW, what was the best compliment you received and from whom? Sreejith: I think the fact that Anaita chose our film amongst some really well-made films is in itself a huge compliment. I’m so thankful to all the people who were there to see it, to Vogue for the honour and to all the people who wrote about it. iCynosure: What is your favourite part about being a fashion designer? iCynosure: What is your opinion about eco-fashion? Sreejith: I wouldn’t call it eco-fashion, I’d say we must encourage sustainable fashion. It must be about buying clothes that make sense, both to the maker and the wearer. When you buy a piece, ask yourself about the people who worked on it, the hands that have brought that piece together. iCynosure: How would do you describe your personal fashion and style? Sreejith: My style is very eclectic. For me, clothes have to have a story. I’m a mix of all the things I’ve been and done. And I say that through clothes. iCynosure: What is the top print for the season? Sreejith: That’s a vague question, especially because I don’t blindly follow what motif to use, I’d say go artistic. Let the brush speak for itself. We’ve used illustrative embroidery this season. That was such a fun conversation we had… Apart from being a brilliant designer, Sreejith is humble, down-to-earth and a straight-forward person, one of the very few gems in the world of glitz and glamour. Stay connected with him on Facebook and Twitter. Also, check his website Rouka and tell us in the comment below which is your favourite design by him… We have a surprise lined up for you gorgeous readers. Update: The winner of the Facebook Contest who wins Rouka by Sreejith Jeevan's Cream Sheer Jacket is Annu Dogra. Send your shipping details along with a photo identity to claim your prize at icynosureblog@gmail.com.